Some summers you pray each day for a little rain. There are also some summers where you wish the rain would just stop, especially if you are the one responsible for keeping the lawn mowed. What do you do when it rains each day? Can you mow wet grass with a zero turn mower? 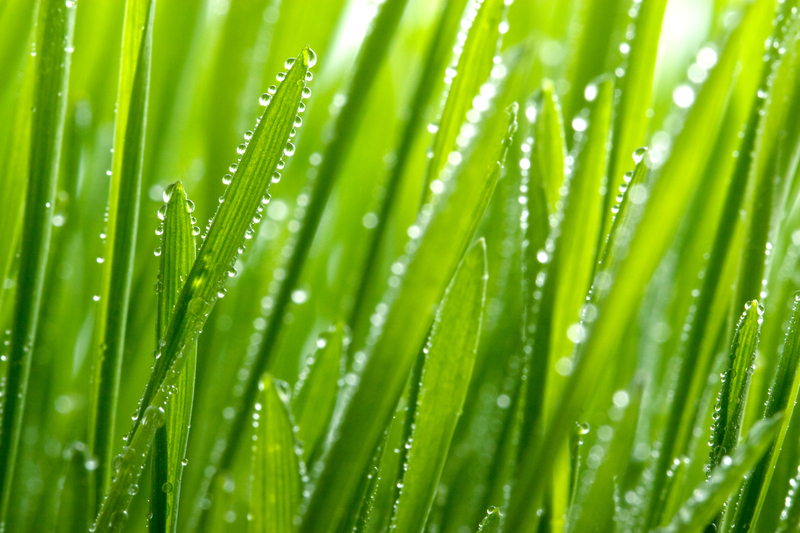 If you are experiencing a rainy and wet summer, check out these tips to cut wet grass using your Spartan Zero-Turn Mower. One of the many reasons people make the switch from a standard riding mower to a zero turn mower is because zero turn mowers are able to cut down the time it takes to mow a lawn. In fact, the Spartan SRT XD Series can get up to 13 mph. However, when it comes to mowing wet grass, it’s better to take things a little slower. After a good rain, the ground is a lot softer, and the grass is easier to pull out of the ground. You DON'T want to pull it out of the ground. You just want to cut it. By slowing down the speed of your zero-turn mower, you can effectively cut the grass. Because the ground is softer after it rains, you do run the risk of tearing up your lawn if you are not careful. As mentioned above, you should take things slow. Here are a few other things you can do to reduce the risk of pulling grass completely out of the ground. Slow your throttle - To cut wet grass as gently as possible, slow down your engine throttle. By pulling back the engine throttle, you not only slow down your zero-turn mower, but the blade tips also slow down. Make your turns round - If you have been around zero turn mowers very long, then you know that for the best cut you should use what is called a square turn. In a square turn, you stop, pivot, and turn. However, when grass is wet, round turns are better since they reduce the possibility of tearing up your yard. Sharpen your blades - Having sharp blades is one of the keys to mowing wet grass. Before you get started, make sure your blades are sharp. It is also suggested that you keep your mower deck height set to the highest or next to the highest level. And after you are finished mowing, make sure you clean your blades and your deck. You don’t want the wet grass to dry or get moldy. 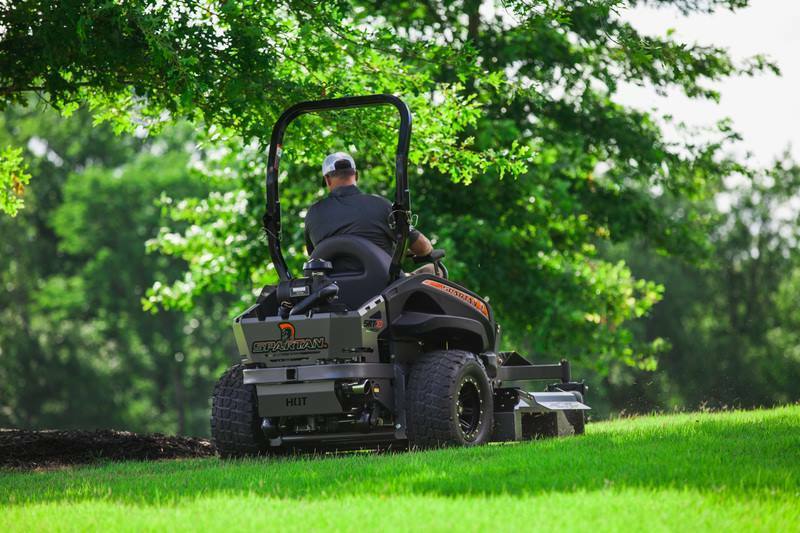 Spartan Mowers are equipped with GT Trac which is designed to take on small inclines and hills by giving you precision traction and balance. However, when you mow hills and inclines that are wet, it’s a completely different ballgame. Wet, saturated ground makes it difficult for almost any machine to maneuver hills. Because of this, it is advised that you wait it out and let the grass dry when it comes to mowing inclines and hills. At Spartan Mowers, we don’t advise mowing your lawn in wet conditions. While zero-turn mowers CAN mow wet grass if necessary, it’s just not the prime condition for mowing. Not only will you not get the cut that you desire, but you could really do some damage to your yard, and it’s just not as safe. If there is a chance that drier conditions are on the way, then wait it out if you can. However, tall, wet grass is much harder to cut. You don’t want to let it grow out of control. And if you have to regularly cut wet grass, then you need a zero turn mower like a Spartan Mower. Zero turn mowers are designed completely different than walk-behind mowers and even riding lawn mowers or lawn tractors. Their independent wheel motors and independent steering give you more control. Are you ready to take on your lawn? Ready for an upgrade? Spartan Mowers is taking over the turf industry one zero turn mower at a time. Don’t just take our word for it. Use our DEALER LOCATOR to find a Spartan Dealer near you and go see the Spartan difference yourself.